1st - St. Agilbert, Bishop, c. 690. Became bishop of Dorchester shortly after its founding by Birinius. After Cenwallah divided the diocese, he left for France where he consecrated Wilfrid and others as bishops. Theodore of Tarsus on his way to become archbishop of Cantaur spent long time with Agilbert to learn about the English Church. Became bishop of Paris. - St. Catherine of Palma, Religious, 1574. Raised by an uncle who treated her cruelly, especially for her religious devotions. When about 15 she heard the voices of St. Anthony of Padua and St. Catherine of alexandria calling her to the religious life. A hermit priest came to her rescue, and was employed by a family sympthetic to her piety. At 20 she entered the Canonnesses of Augustine in Palma. Known for her esctasies. - Frederick Denison Maurice, Teacher and Priest, 1872. A founder of the Christian Socialist Movement. Best remembered work, The Kingdom of Christ demonstrated his philosophical approach to theology. 2nd - Francis of Paola, Hermit & Monk, 1507. As a teenager became a hermit, and was joined by others which led to the formation of the Franciscan Minim Friars, approved in 1474. Became famous for his prophecy and miracles. Prepared Louis XI of France for death, and often worked as a peacemaker between warring countries. 3rd - St. Richard of Chichester, Bishop, 1253. Also observed on 16th June, the day his remains were translated to Chichester. - St. Luigi Scrosoppi, Priest, 1884. Worked in an orphanage home for girls, for which he recruited nine young women to dedicate their lives to the oprhans. Turned this community into a religious order of the Sisters of Providence of St. Cajetan of Thiene. He became an Oratorian and devoted is life to prayer and other spiritual exercises. 4th - St. Isodore of Seville, A'bishop, 636. His 36 years as archbishop is extremely important. Following on the work of his brother, Leander, completed the work of converting Visigoths from Arianism and organising the Church in Spain through synods and councils, of which the most notable were Seville, 619, and Toledo 633. One of the decrees stated that every diocese have a cathedral school. Completed the Mozarabic missal and breviary. Was also a great writer and a champion of the poor. - St. Plato, Abbot, 814. After renouncing all his earthly possessions, entered a monastery on Mt. Olympus. Here he was assigned to copying manuscripts and compiling an anthology from writings of the Fathers. At 36 appointed abbot. Later became abbot of the Sakkudion near Constantinople. When the emperor Constantine Porphyrogenitus divorced his wife to marry another woman, Plato and his nephew, Theodore Studites, condemned the emperor who imprisoned and then exiled him. Returned to his monastery where he continued to denouce the emperor and was exiled once again. 5th - St. Vincent Ferrer, Dominican friar, 1419. A renowned preacher and philosopher who had notable success in converting Jews including the Rabbi Paul who became bishop of Cartagena. The Schism pope, Benedict III invited him to Avignon, where Vincent advised him to be reconiled with Urban VI. At Council of Constance in 1414 aimed to end the schism Vincent again worked to end the schism. Canonised in 1455. 6th - St. Elstan, Abbot & Bishop, 981. A monk at Abingdon, trained by its founder Ethelwold; afterwards became Abbot of the Abingdon. Later he was appointed bishop of Ramsbury, the poorest of Wessex sees. 7th - St. John the Baptist de la Salle, Religious, 1719. Founder of the Brothers of the Christian Schools. After being ordained a priest he and a layman, Adrian Nyel opened 2 schools for poor boys. Sold all his goods and devoted the proceeds to famine relief in Champagnes and dedicated his life to education. Opened 4 schools despite difficulty and ere long parish priests were sending young men to train as teachers. To meet this need open the first training college at Reims in 1686, followed by ones at Paris & Saint- Denis. One feature of his order was that only laymen could belong to it. 8th - St. Julia Billiart, Religious, 1816. During the Revolution she offered her home as protection for priests. Spent most of her life paralysed. Founded the Sister of Notre Dame de Namur after a vision she had for the purpose of educating girls. After the Battle of Waterloo nursed the wounded and died shortly afterwards. 9th - St Gaucherius , Hermit & Abbot, 1140. Also known as Walter, abbot founder and friend of St. Stephen of Grandmont. Became a hermit in the forest of Limoges with a companion, Germond. Attracting disciples even though he was only eighteen, Gaucherius founded St. John's Monastery at Aureilfor and a convent for women. He died from a fall from a horse. He was canonized in 1194. - St. Waldetrudis (Waudru), Religious, c.688. Came from a family of saints, and married one, Madelgar., and their four children were all saints too. In their late life Waldetrudis and Madelgar retired to monasteries. - Dietrich Bonhoeffer, Pastor & Martyr, 1945. Leader of the Confessing Church which broke away from Nazi-dominated Lutheran Church in 1934. His theological works influential in post-W.W. II Church. Arrested in 1943 for his defiant opposition to Nazism, and murdered by nazi police shortly before the war ended. 10th - St. Fulbert, Bishop and Poet, 1028. Helped in the Cluniac Reforms. Rebuilt the cathedral of Chatres after it burned down. Wrote hymns and treatises. - William Law, Pr. & Spiritual Writer, 1761. A Non-Juror but best known for his A Serious Call to a Devout and Holy Life, which has influenced many to develop a personal prayer life. - William of Ockham, Friar, Philospher & Teacher, 1347. Taught in Oxford. The ablest theological & philosophical thinker of the early 14thC. Protested against papal absolutism. - St. Michael de Sanctis, Religious, 1625. As a child had geat devotion to the saints, especially our Lady and St. Francis of Assisi. Entered the Trinitarian monastery, and became a priest. Often experienced ecstasy when celebrating the Eucharist. 11th - George Augustus Selwyn, Bishop, 1878. 1st Bp. of New Zealand where he served for 27 years, endeavouring to break down the barrier between colonists and Maoris. Was a chief founder of the Lambeth Conference of Bishops. - Stanislaus of Cracow, Bp. & Martyr, 1279. Patron saint of Poland a zealous reformer & tireless preacher - a quarrel between him and the King led to his death. - St. Godeberta, Religious, c.700. When taken to the French Court by her parents to find a suitable husband, the saintly bishop of Noyon, Eligius, took his episcopal ring from his finger and placed it on Godeberta to show that her life was consecrated to Christ. She immefiately asked him to veil her, and be her spiritual director. The Frenck king,l Clotaire III, donated his home at Noyon, to be a convent where she and 12 other girls joined her. When plague struck she convinced the clergy to call a three day fast, after which the plague abated. Another time when fire threatned the city, she had herself caried to the site (as she was ill) and made the sign of the cross over it, and it was extinguished. 12th - St. Julius, Bishop, 4thC. Elected bp. of Rome in 337 and soon involved in Arian controversy, especially when Athanasius was exiled. To Eusebius of Nicomedia, who supported Arianism, he declared that he had reinstated Athanasius to Alexandria. Built severasl basicilas and churches in Rome before he died. - St. Sabas the Goth, Martyr, 372. As a child loved to pray in church. During a persecution under the Gothic king Athanaric, friends tried to hid him, but Sabas insisted to declare his faith. This time he escaped imprisonment, but when the persection worsened, he was tortured and executed. - St. David Uribe Velasco, Priest & Martyr, 1927.With the persecution of the Church by the government, he became a fugitive. Captured and sentenced to death but his parishioners obtained his release. After returning to Iguala, was shortly arrested, promised his freedom if he would become a puppet bishop. Refused and was executed. 13th - St. Martin I, Bishop & Martyr, 655. After becoming Pope held a council at Lateran in 649 in which he condemned the error of Monothelitism and the Typos and edicts of Constans II, but opposed by this Emperor who arrested him and took him to Constantinople where he endured imprisonment, flogging and insults. At the intercession of the Patriarch of Constantinople his life was spared and was exiled to the Crimae where he died. Was the last Pope venerated as a martyr. 14th - St. Tiburtius, Martyr. 3rdC. With Valerian & Maximus included in the Acts of St. Cecilia. Their tombs in the cemetery of Praetextatus were exceedingly popular during the Middle Ages. According to the Acts, Valerian was Cecilia's husband, Tiburtius her brother, and Maximus a Roman soldier or official who died with them. 15th - St. Paternus, Hermit, 5thC. Founded the monastery at the great church of Paternus, and became a bishop of that region. He was known for his preaching, charity and mortifications. Scholars believe his story is an amalgam. - St. Ruadan of Lothra, Abbot, c.584. One of many students taught by St. Finian. Founded a monastery at Lothra dedicated to prayer and manual work. It also attracted many monks. Known as one of the "twelve apostles of Ireland". - St. Hunna, Laywoman, c.679. Although a wife of a nobleman, she washed the clothes of her poor neighbours, and became known as "the holy washerwoman". Her son was baptised by Deodatus, bishop of Nevers in France, who also took the name of Deodatus who became a monk. 16th - St. Bernadette of Lourdes, Religious, 1879. On Feb. 11th 1858 was granted a vision of our lady on the Gave R. near Lourdes. The Virgin announced her Immaculate conception. Eventually, especially through the influence of Empress Eugene a church was built on the site which had earlier gushed healing waters. - St. Optatus & Seventy Companions, Martys, 304. These were tortured and executed by the Roman governor Dacian in Saragoss, during the persecution under Diocletian. - St. Turibius of Astorga, Bishop, 450. Combated the heresy of Priscillianism and worked to enforce clerical discipline and reform the morals of society. - St. Encratis, Virgin & Marty, 304. A Portugeuse lass who had fled to Saragossa to preserve her virginity. Here she denounced the cruelty of Dacian, and was in turn terribly tortured before finally being killed. - Isabella Gilmore, Deaconess, 1923. Approached by the Bishop Thorold of Rochester to pioneer the work of deaconess in his diocese. Made a deaconess in 1887 and in a house at Clapham, later known as Gilmore House, she trained deaconesses for at least another seven dioceses. A remarkable holy woman. 17th - Stephen Harding, Abbot, 1134. Co-founder with Robert of Molesme of the Abbey of Citeaux to follow a life of great simplicity. Thus the founder of the Cistercian Order. It was Harding who guided the great St. Bernard who in turn became Abbot of Clairvaux. 18th - St. Apollonius, Martyr, 185. His Apologia, or defence of the faith, is considered one of the most priceless documents of the early Church. Apollonius was a Roman senator denounced as a Christian by one of his slaves. Arrested by the Praetorian Prefect, Perennis who demanded that he denounce the faith, and when he refused, the case was remanded to the Roman senate. There a debate took place between Perennis and Apollonius that clearly outlines the beauty and the value of Christianity. Despite his eloquent defence, Apollonius was condemned and beheaded. 19th - St. Alphege, abbot, archbishop & martyr, 1012. His austere life and lavish almsgiving made him a revered and much-loved abbot and bishop. Appointed Archbishop of Canterbury, in 1005, shortly before the Danes overran S.E. England, taking Alphege prisoner. An enormous ransom was put upon his head, but Alphege forbade anyone to do so, as it would impoverish the people. Thus Alphege was brutally murdered. 20th - Caedwalla, King of Wessex, 689. successful ruler who gave up his throne to go to Rome to become a Christian. Baptised Holy Saturday 689, and died soon after still wearing his baptismal robe. 21st - St. Anselm, abbot, archbishop & theologian, 1109. Spent 34 years at the abbey of Bec, Normandy where as monk and abbot taught and wrote theological, philosophical and devotional works which have been so influential in the Western Church. Appointed Archbishop of Canterbury in 1089, but twice endured exile through his championing the rights of the Church against the authority of King William II (William Rufus). 22nd - St. Epiphanius & Alexander, Martyrs, 178. Martyrs of Lyons, France. They were young when they died. Epidodius was beheaded. - St. Soter, Bishop & Martyr, 177. Bishop of Rome from 173-177 when there was much persecution in the Church. His letter to the Corinthian Church was much treasured for its spiritual teaching. Opposed the heresy of Montanism. 23rd - George, Martyr, 304 Patron Saint of England. In the East he is known as "The reat Martyr." Probably a soldier, martyred at Lydda. The icon of his slaying the dragon is probably due to his being mistaken in iconography for St. Michael, or Perseus' slaying of the sea monster, a myth associated with Lydda. - St. Adalbert of Prague, Bishop, Missionary & Martyr, 997. As bishop of Prague tried to evangelise parts of Hungary and Bohemia. Exiled in 990 by nationalists, but soon recalled by Duke Boleslas. Forced to leave his country again when a penitent prostitute who had taken shelter in Benedictine convent founded him, was dragged out and killed by her accusers. His last years were spent converting the Prussians under Otto III. Martyred as a possible spy from the king of Poland. Important missionary in bringing the Gospel to Eastern Europe. 24th - Mellitus, Bishop, 624 First bishop of London who dedicated his church to St. Paul in 604. Appointed 3rd Archbishop of Canterbury in 619. - Fidelis of Sigmaringen, Religious & Martyr, 1622. A Capuchin monk sent to preach in the canton of the Grisons. Was martyred in Seewis, Switzerland by a band of heretics. - St. Anthimus, Bishop & Martyr, 303. Bishop of Nicodemia when Diocletian'd edicts took effect that all churches were to be closed. The edict was pulled down by a Christian, which led to all clergy being made to offer incense to to the pagan gods. Anthimus led his flock in refusing and was beheaded. - St. Elizabeth the Miracle Worker, Religious, c. 9thC. Abbess of SS. Cosmas and Damian convent in Constaninople where she lived a rigorous life of prayer, fasting and self-denial. Known for her healings of the sick and expulsion of demons. 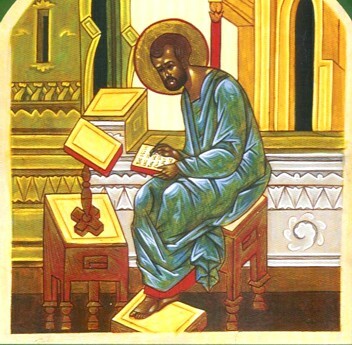 25th - ST. MARK, Evangelist - The Gospel bearing his name is generally regarded as the earliest. Its basis is what Mark wrote, probably in Rome from his own memory of Peter's preaching. In Rome with both Paul & Peter. As cousin to Barnabas he too was involved in missionary work, firstly on the first Missionary Journey, and then in Cyprus. 26th - St. Cletus "Bishop", Martyr, 91, but in reality he was only a presbyter in Rome, and followed St. Linus. The canon of the Roman mass, styles Cletus a martyr. He was buried near St. Linus, on the Vatican, and his relics still remain in that church. - St. Franca of Piacenza, Religious, 1218. Entered the Benedictine convent of this town at a very early age, where she later became Superior. However many grumbled against her austeries and she was removed from office. She shortly became first superior of a Cistercian nunnery founded by a friend, Carentia. In the chapel here she spent her night in prayer. 27th - St. Zita, holy woman, 1278. At the age of twelve Zita became a housekeeper in the house of a rich weaver in Lucca, Italy, eight miles from her home at Monte Sagrati where she stayed for the last forty-eight years of her life. She found time every day to attend Mass and to recite many prayers, as well as to carry out her household duties so perfectly that the other servants were jealous of her. Indeed, her work was part of her religion! She use to say: "a servant is not holy if she is not busy; lazy people of our position is fake holiness." At first, her employers were upset by her generous gifts of food to the poor, but in time, they were completely won over by her patience and goodness and she became a very close friend. Word spread rapidly in Lucca of her good deeds and the heavenly visions that appeared to her. She was sought out by the important people, and at her death in 1278 the people acclaimed her as a saint. She is the patroness of domestic workers. - Christina Rossetti, Poet, 1894. Sister of Dante and so associated with him and the Pre-Raphaelite Brotherhood. As a poet she reflected her Anglo-Catholic faith and the breaking off of her marriage to the artist James Collinson, a devout Roman Catholic. In his famous painting of The Renunciation of Queen Elizabeth of Hungary, the face of Elizabeth is that of Christina. 28th - Peter Chanel, Missionary & Martyr, 1841. The proto-martyr of the Pacific. A Marist missionary to the Fijian island of Futuna who brought both Gospel and medicine. When the chief's son desired baptism, the father had him murdered. Within a year the entire island was Christian. - St. Louis Mary de Monfort, Priest, 1716. Devoted his life to the poor and sick and preaching across France. For these works he founded the Daughters of Wisdom aand the Missionaries of the Company of Mary. Wrote many spiritual works concerning Mary's role in the mystery of salvation. 29th - St. Catherine of Siena, Doctor, Mystic & Spiritual Writer, 1380. Patron saint of Italy. A life of contemplative prayer enabled her to give spiritual help to many, including advice to the Avignon Pope to return to Rome. Wrote A Dialogue on the spiritual life, and cared for the sick and poor. - St. Peter of Verona, Religious & Martyr, 1252. Raised as a Cathar, but converted to Catholicism and became a Dominican. Travelled throughout Italy peaching the Faith to convert Cathars. Once he was accused of heresy. Whilst travelling to Milan was ambushed by Cathars and martyred for the true Faith of Christ. - St. Hugh the Great, Abbot, 1109. Abbot of the reformed Cluny monastery where he strove for clerical reform as laid down by Gregory VII. At Cluny he strove for the Liturgy to be celebrated with solemnity and splendour. Credited with singing, Veni Creator Spiritus, in the Office of Terce on Pentecost. A man of prayer and of study of the Scriptures, he also founded a leprosarium. 30th - Pandita Mary Ramabai, Translator, 1922. Daughter of a Sanskrit scholar she converted to Christianity. Became well-known as a lecturer on social questions as well as promoting education for women and caring for orphans in her schools and homes. Opposed the caste system and child marriage. - St. Pius V, Pope, 1572. A Dominican before being elected Pope. Vigorously implemented the reforms of Trent Council. It is said that his prayers and recitals of the Rosary were responsible for victory at Lepanto against the Turks, off the western Greek coast. - St. Gualfardus (Wolfhard), Hermit, 1127. Before becoming a recluse noted for his gifts to the poor in Verona. In his abode on the banks of the Adige river he spent many years as a hermit, before his dwelling became known. The people of Verona pressed him to return, and he became a hermit-monk in Camaldolese prior. Easter is mostly celebrated this month; It is the Queen of all Festivals, when we celebrate the truimph over death by our Lord Jesus Christ. It is the oldest of all celebrations in the Church, of which there are traces of its keeping in the letter to the Colossians. "Christ is risen. He is risen indeed" has been shared between Christians since Apostolic times. HE IS NOT HERE. HE HAS RISEN AS HE SAID. CHRIST IS THE FIRST FRUITS OF ALL THOSE WHO HAVE DIED.